Then there are other types of time blocks that are possible too: unexpected time blocks. They may occur suddenly and without any warning, but with some advance planning you can take advantage of those time blocks too. 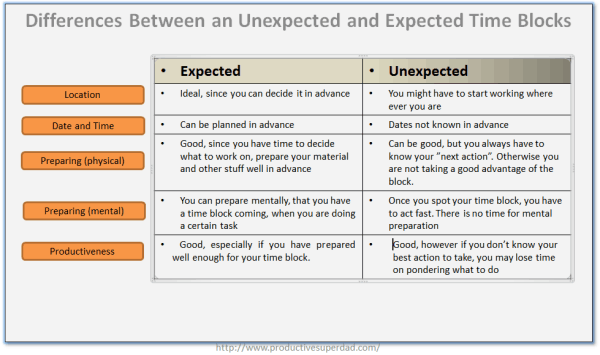 How does an unexpected time block differ from an expected one? First, let me define what a time block is. It is just a segment in your calendar, reserved for a certain task. To make your time blocks even more effective, you try to find your most productive environment for the task, do necessary preparation (both physical and mental) and find the appropriate date and time for it. However, things get a bit trickier when you have an unexpected time block in your hands. For example, all of a sudden you realize, that your home is quiet and you have a chance to work on your personal projects. That one extra free time is luxury for any work-at-home-dad and based on your preparedness, you can take full advantage of that moment (for example by working on your business, personal projects, reading a business/personal development book, taking a nap …). As you can see, there are certain differences between those two. However, with some simple planning, you can take maximum advantage of those unexpected time blocks as soon as they arise. Can you predict unexpected time blocks? Although the nature of unexpected time blocks is just like that – unexpected – you might still have some clues on what might be coming. For example, you can expect that your wife and child (or children) are taking an afternoon nap most of the days. Even if you cannot be sure about it, you can still do a game plan on what action to take if a free moment occurrs. Another way of predicting is to listen carefully what your spouse is saying (and yes, you should do it in any circumstance, but especially when it comes to time blocks :)) and if there are any hints given between the lines. For instance, if your spouse is saying that he/she might do some shopping and is taking your child with him/her, you can expect that there is a time block coming. In general, you will learn to expect those extra time blocks to occur, if you keep your ears open. And better you come at it, the more extra time there is available for you. Also, when you predict something occurring, you are also mentally expecting it to happen (thus you mind starts to prepare for the coming task in advance). How to prepare for an additional free time in advance? Even if time blocks may come unexpectedly, there are certain ways that you can take advantage of them. You have to always keep in mind, what you want to do next. That way you are not left pondering your options when there is some additional free time in your hands. If possible, predict and expect if a time block will occur soon. As stated in the chapter “Can you predict unexpected time blocks?”, there is still a chance to find out about these blocks in advance (at least in certain scenarios). When you have some extra time in your hands, you have to act immediately! There is not even a minute to waste. If you know your next action already, then taking action becomes easier. And the faster you start working on your task, the better chance you have to get it done before the time block ends. If your time block/action happens on a computer, you should make it even more effective by using a timer. 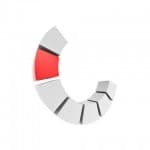 Timer is a great way to improve your productivity – sometimes even dramatically. Finally, many times we may overlook this, but it is important to feel gratitude for the extra time block you had. I don’t know about you, but it gives me a good feeling inside and this good feeling makes me even more productive. Especially in the WAHD setting, some extra time to work on our projects is like a heaven sent, so appreciate the extra time that was available to you. All this time block talk is fine, but to wrap things up, I wanted to tell you my latest unexpected time block experience. Just couple of days ago, I came home from work. The moment I stepped inside my home, I realized that that it was quiet and all the lights were turned down: my wife and our baby were taking a nap. It didn’t take me even a half-second to go to my work room, close the door behind me, turn on my laptop and start working on some SEO (search engine optimization) tasks for my redesigned blog. Our home was quiet, so I was able to work without interruptions for an hour. Since I knew what my next action was and I acted immediately, I was able to get some work done. I felt grateful for this time block which I was able to use for my personal tasks. Even if your days could be full of distraction and you feel you don’t get anything done, keep your ears open for some unexpected time blocks. They will (as the term implies) surprise you but if you have prepared for them at least a bit, you can take the maximum advantage and get some work done. When was the last time an unexpected time block occurred for you?